On Wednesday, 45 Year 9 students attended an inspirational mathematical show in Exeter at the Northcott Theatre. 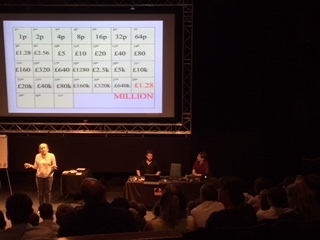 The show was completely interactive aimed at 14-17 year olds, it gave them the chance to experience the UK’s most inspiring maths speakers live in a theatre, presenting mathematics in the context of exciting, real-world applications. Ben Sparkes, Rob Eastaway and Helen Pilcher presented the show. All students were engaged, inspired, laughing and enjoying the use of the mathematics in the context of playing games. Joni from Launceston College was the first student with his hand up to take part in the show and quickly won the first game called ‘yukky chocolate’. The aim of the game was to get the other player to take the last piece of chocolate. Joni’s strategic planning paid off as he came out the victor. The students then had a go at the game of life, learning about how populations grow, stabilise or decline. What interested the pupils is that this mathematics started as a interest or a game and has moved into now what we know as artificial intelligence. They played many games that had a lucky or strategic theme; card games, money games and just simple games like taking the last piece of pizza. Ellie realised she wasn’t as trustworthy as she thought, her and Megan took part in trying to win a share of £100. They had to write down the largest number on a piece of paper, then divide 100 by that number, if they had the highest number they would take that amount home or share it if more than one of them wrote the same number. Someone worked out that if they all wrote 1 then all 20 of them would take home £5. However, some tried to beat each other and write higher numbers. In the end they only took home 1p, aptly this game was called ‘Greed’. They finished with teaching the students that unless you have a good understanding of mathematics you can be taken advantage of. Like the student who tried to take advantage of their parents by writing a contact for pocket money, that started at 1p each day and doubled each day, as long as they did their chores. After the first week the parents felt a little guilty, giving their child only up to 64p a day. However by the end, the child’s pocket money was over a million pounds a day (see the picture of the calculations below). Be careful, don’t allow the students who came with us to dictate their pocket money, they might now try this trick out. As you can see from the few quotes below the students really enjoyed the trip and now have a further understanding of how maths can be used to ‘play for real’.